At River Valley Construction Company, LLC we are in the business of solving your underground problems and we do this by providing value and integrity before, during, and after construction. 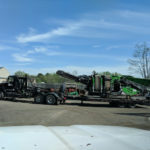 For decades, we have been providing professional excavation and site work services to residential and commercial customers throughout Connecticut. From pre-construction to final completion, our mission is defined by our values and unprecedented customer service. Whether you are looking to pave a street, dig a foundation or develop a subdivision, we can help. Our company is able to complete the entire site package, which eliminates the need for you to hire more than one contractor.